Today’s game is quite unusual as it’s an early FPS game supporting EGA 16 colour graphics. It was released after Wolfenstein 3D in 1992, but isn’t a clone as it’s a sequel to the earlier game Catacomb 3D (1991). 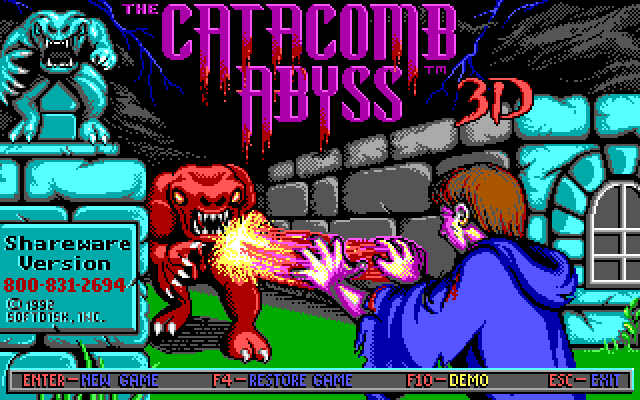 Both Catacomb 3D and Abyss were made using a earlier version of the Wolfenstein 3d engine, the first being made by id software for Softdisk and the second by staff at Softdisk using the same engine. So in that sense you could consider both to be a pre-cursor to Wolfenstein 3d technology wise. The story is fairly simple and is a continuation of the first Catacomb 3d series. Nemesis, the antagonist from the previous game is now obviously dead, but his evil minions that are still around have built a memorial mausoleum in the town cemetery and are infesting the area. The local town-folk obviously aren’t too happy about it, so knowing you defeated Nemesis himself they send you in to clean up. 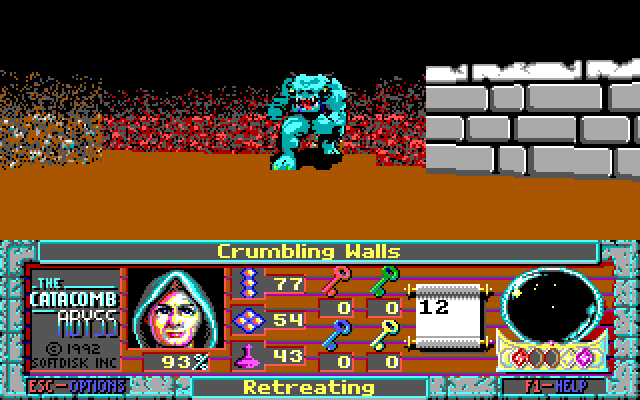 Graphically it’s quite impressive for EGA, artistically the sprites and wall textures are fairly well done for 16 colours. Performance wise the engine performs quite well under dosbox, which was configured at 3000 cycles which is roughly equivalent to a 20Mhz 386. I’d expect it to also be quite playable on 286 machines with the exception of slower ones. The engine however isn’t perfect, monsters can get close enough to you that they are no longer displayed. This tended to happen when they spawned very close and made it quite difficult to kill them. I found using the Xterminators usually helped. I also noticed that the texture mapping on the walls sometimes appeared a bit off, and that text on the walls was often hard to read. Despite the faults, the game looks nice and is quite atmospheric. Sound support defaults to the PC speaker, which sounds ok. You can switch the game over to using Ad Lib sound, but the user interface and documentation don’t make it clear that it’s available and how to turn it on. I played for ages before realising there was another option. Once you manage to get it working the Ad Lib sound effects are quite effective, but they are loud and some of them are a little crackly. This could be down to imperfect emulation of the FM chip in dosbox, but I suspect it’s the pseudo-digital sound effects that are the cause. The levels are quite short, but still big enough you can get lost. They rely on destructible walls quite a bit, which fortunately are usually easy to spot. They hide them as blocks that are different to those around them or a short and easily recognisable pattern. With infinite basic shots you should be able to find them fairly easily. There are doors with keys, but they don’t have a nice opening animation instead simply vanishing instead. Which could be the reason they aren’t used very much. As you work through the game there are a variety of settings, each with their own graphic style, and typical monsters found there. 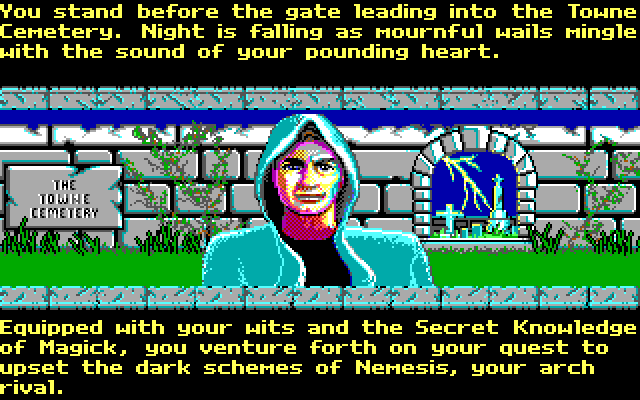 You start off in the “towne” cemetery and work your way into the mausoleum and then crypt for Nemesis. For some reason not clearly explained you then end up deeper underground and then the segment that I’m up to, the aqueduct. On the up side each setting is fairly different visually, and some like the aqueduct change things up with different monsters. There isn’t a huge variety of monsters in each level, but they get progressively stronger and have more variety in later levels. The basic monsters use melee attacks primarily, which can be a problem if they get too close. Zombies, which appear in the earlier levels, are not visible until they climb out of the ground. This sometimes happens when they are already too close to see, so you may need to use a Xterminator as moving away seems futile. In later levels I’ve seen some more interesting enemies such as floating wizards that shoot fireballs at you, large beasts, and what can only be described as aquatic zombies that hide under the water popping up every now and then. There’s only really one weapon, a fireball that you can rapidly fire. You can’t charge it like the original 2d game, but you can make up for that with volume of fire. The two spells that you get aren’t really different weapons, but rather variations on the basic fireball. The Xterminator previously mentioned basically just fires standard fireballs in a circle around you, useful when many enemies are close, or you want to hit one you can’t see. The Zapper essentially just sends out a pulse of rapid fire and is less useful as you can achieve the same rate of fire manually. Controls are fairly similar to those in Wolfenstein 3d, but not quite as refined and polished. Turning and moving are as you’d expect, but the control turning faster is the tab or v key, which can be a little cumbersome to reach. The alternative is to turn much slower, giving enemies more time to hurt you. This aside the controls work fairly well. 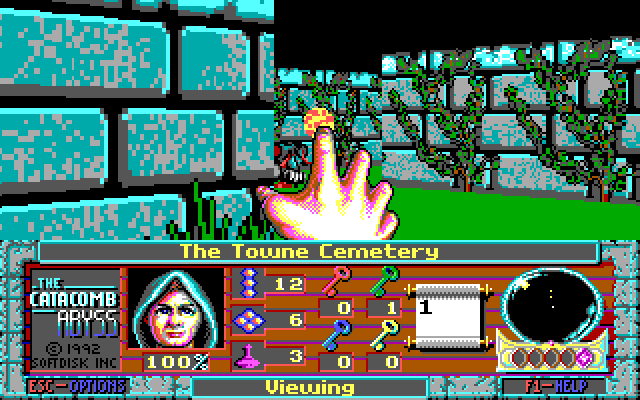 Catacomb Abyss is the only one of the series that was ever available as shareware, consequently it’s the only one easy to download. From what I’ve played, it’s actually quite decent although a little clunky in some aspects like the controls. Still it has great atmosphere and having short levels means you don’t get as lost as you might with something like Wolf3d. You can buy this along with the rest of the series on the Good old Games website for I think about $8 US dollars.